Enjoy Highlights from our Past Events! Our AMA collegiate chapter will be heading to New Orleans this week on April 10th to attend the AMA International Collegiate Conference (NOLA) April 11th – 13th, 2019. We’re very excited to learn from industry professionals about careers and cutting edge marketing and sales practices and celebrate our successes for the 2018-2019 academic year! Join us for an our cultural Index Workshop learn about your key personality traits and how they align with your choice of career. Participating in the cultural Index survey will give you insight in to key strengths and weaknesses that may determine success in future roles. Join us for an evening with Briana Lee from Tyson Foods to hear some key insights regarding the food and beverage industry followed by Q&A session. Join fellow AMA collegiate chapter members to learn from marketing experts in varying fields. Join AMA members and your fellow UIC Business students for a site visit to Leo Burnett Chicago downtown office. Join AMA members and your fellow UIC Business students for a site visit to IBM Chicago downtown office. Join AMA members and your fellow UIC Business students for a site visit to LinkedIn Chicago downtown office. Join us for an evening with Marcelle Hana from Kraft Heinz Chicago to hear some key insights regarding the food and beverage industry followed by Q&A session. Join AMA for a fun and competitive night this Friday March 1st by participating in a Dodge-ball game with other student organizations on campus. Join us this week in Windy City, for our first Philanthropy event of the semester where our AMA members will be dedicating some of their time to create lunch packages and distribute them to those in need. Packaging Location: Bekah’s Apartment, then Downtown Chicago for food distribution. We would like to invite you to our Digital Footprint Workshop to learn how to create your online website/Portfolio to increase your visibility and online presence in simple short steps! Join AMA members and your fellow UIC Business students for a site visit to WalkerSands Chicago office. Join us for an evening with Adrienne Nadeau from Maru/Matchbox Chicago to hear some key insights regarding industry followed by Q&A session. Join us for an evening with Shannon Duggan at GroupOn Chicago to hear some key insights regarding industry followed by Q&A session. Find out more details regarding our speaker here. Join AMA members and your fellow UIC Business students for a site visit to Pepsi Co to Chicago downtown office. Join AMA members and your fellow UIC Business students for a site visit to Ogilvy & Mather Chicago downtown office. Join us for an evening of networking with AMA UIC Professors and Marketing Professionals during a moderated Q&A session.Find out more details regarding our speaker here. Join us for an evening with Daniel Spillane, Director of Growth Initiatives at IBM Global Services to hear some key insights regarding industry followed by Q&A session. Find out more details regarding our speaker profile here. Join AMA members and your fellow UIC Business students for a site visit to Ogilvy & Mather Chicago office. Join AMA members for a game night between Chicago Bulls vs Mavericks. Join AMA members and your fellow UIC Business students for a site visit to Social Deviant Chicago office. Interested in working in sports marketing? Learn more about the industry from our UIC Flames guest speakers: Ricardo Diaz, Kyle Decker, Kimberly Essary, and Katelynn Maxhimer. Topics include: how to break into the industry, in game operations and promotions, ticketing and community outreach. Our guest speakers also have experience working with professional teams such as: Chicago Bears, Chicago Cubs, Chicago Blackhawks, Chicago Fire, Joliet Slammers, and Horizon League. UIC’s AMA and Alpha Kappa Psi chapters aim to create a network for UIC students to create a strong personal brand and provide them outlets to strengthen their skills as marketers and overall business professionals. 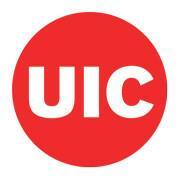 Join us for an evening of networking with UIC Alumni during a moderated Q&A panel session. Join us for an evening of networking with AMA UIC Alumni during a moderated Q&A panel session and build your personal brand with free professional headshots. Are you ready to network with your fellow AMA members outside of the classroom, and learn how they can help you further your career in Marketing? Do you want to know what being a student member has to offer? Do you just want to socialize with some of the professional students at UIC? Put away the selfie and upgrade your LinkedIn profile with a free professional headshot. Get noticed by colleagues and recruiters by letting AMA help you strengthen your profile! Join AMA during our meetings or at AMA events! At our meetings, learn about how UIC’s AMA chapter can help further your future in marketing. Our AMA events will help you develop professional skills and be beneficial in furthering your career in marketing.